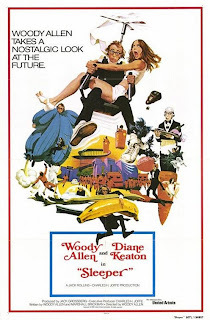 Tag line: "Woody Allen takes a nostalgic look at the future"
After checking into a hospital for routine ulcer surgery in 1973, Miles Monroe (Woody Allen) slips into a coma and is cryogenically frozen. Revived some two hundred years later by an underground society, Miles finds a world controlled by a totalitarian regime, one that’s not too happy to have him around. On the run from the authorities, he disguises himself as a robot butler assigned to a goofy poet named Luna (Diane Keaton), who also happens to be one of society’s privileged few. Before long, Miles convinces Luna that the police state she lives in is unjust, pushing her into an alliance with rebel forces out to overthrow the government. So when Miles himself is taken into custody and reprogrammed, it’s Luna to the rescue! This may sound like serious stuff, but Woody Allen’s Sleeper is actually a comedy, a spoof of the science fiction genre. Allen loads the film with effective sight gags, the funniest occurring at a party hosted by Luna. While still posing as her robot butler, Miles is handed an orb that "stimulates" anyone who touches it, which he must carry from guest to guest. Seeing as he’s not really a machine, the orb soon brings Miles to the brink of ecstasy, resulting in some hilarious behavior as he attempts to stay in character. There are plenty of one-liners as well, like when the scientists who revived Miles warn him that, if the government discovers his existence, his brain will be “simplified”. “My brain?” he replies, “That’s my second favorite organ!” Every now and then, Allen tosses a political observation into Sleeper, and even addresses such lofty topics as science and religion, yet never once does he do so at the expense of the comedy. When Luna asks him if he believes in God, Miles says, “I'm what you would call a teleological, existential atheist. I believe that there's an intelligence to the universe, with the exception of certain parts of New Jersey”. 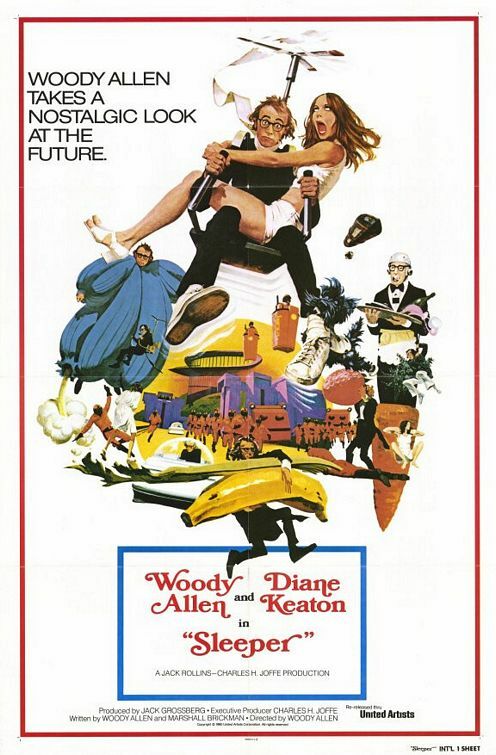 As is the case with many of Allen’s early comedies, some jokes fall flat (a scene where he’s chased by government troops into a genetically engineered garden, which features gargantuan-sized bananas and celery as tall as a tree, quickly loses steam), but as he shows us time and again throughout Sleeper, even those living in a futuristic, fascist society can sometimes have a sense of humor. Also, there were some jokes that were very funny at the time (about Howard Cosell and Albert Shanker and so on) that would fall pretty flat today. It's funny now to remember that he did genre parodies like this once upon a time -- these days his movies, even the good ones, are much less wild. It's like he grew up (and Mel Brooks didn't :-) ).